What's your favourite food to have as breakfast? Oatmeal with lots of fruits and granola. I add things like a banana, blueberries, dried cranberries, dried apricots, almonds, granola and ginger. If I have other fruits, I add or replace to create diversity. Yum. Shakshuka is a middle eastern breakfast dish that I fell in love with at one of my friends home when his mum cooked it for us. I would love to have a simple, traditional Japanese breakfast like my Mom used to prepare when we were kids, but that's not very realistic in today's mad-cap lifestyle. I do make it once in a while though, especially on the weekends. If there's no time, it's usually eggs and soldiers, some fruit and yogurt, and a coffee. Eggs, hash browns, bacon and/or sausage links, and black coffee. Toast and grits are also wonderful. Something with bacon and eggs, biscuit, breakfast potatoes, sautéed favorite veggies and a beautiful platter of pancakes. I usually don't eat breakfast. A croissant is really good, but so are waffles. Oops. But mostly just coffee. Two fried eggs on two slices of ham, baked beans, bellpeppers and a gianormous cup of tea. Breakfast is my least favorite meal of the day so I almost always skip it. Just coffee for me. Thick sliced, apple wood smoked bacon! Bacon with a side order of bacon. A scrambled egg sandwich with bacon and cheddar. Eggs you can pretty much do anything with an eggs. Cereal and maybe a banana. Fried eggs with hot bread and a hot cup of tea. Successfully Appeal to and Attract Women 10 Benefits to Why a Girl Shall Stay Virgin Until Marriage! What It's Really Like to Be an "Ugly Woman" The down side of hooking up Laurie's, ADULT'S ONLY, list of your favorite sexual fetishes and kinks! 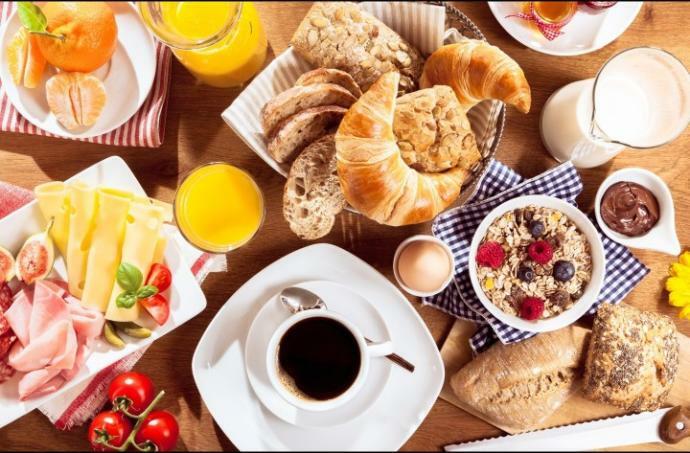 Home > Food & Beverage > What's your favourite food to have as breakfast?